Around this time each year, you’ll see a news story about a farmer with a record-sized pumpkin, one much bigger than anything grown by his neighbors. How did he do it? How did he find success in the pumpkin patch? He did it by nurturing his best pumpkin, a principle that can be applied to any small business. That’s the message of The Pumpkin Plan, a new book by Mike Michalowicz. To make your business thrive, you must weed your garden, like a good farmer. This means removing the pumpkins that are too small or not worth your time, so as to focus on the one great gourd that can grow bigger than all the others. In other words, the Pareto Principle. 80% of your sales come from 20% of your clients. The key to growth is to focus on the most profitable activities of your business. The most interesting section of The Pumpkin Plan is where Michalowicz talks about failure. So many entrepreneurial titles gloss over the hard work of building a business – yet, this is the norm. Each year Americans start one million new businesses, nearly 80 percent of which fail within the first five years. Michalowicz frankly discusses how his company was eating him alive, consuming every waking hour and ruining his family life. Only by concentrating on what he did best was he able to escape this trap. He learned to weed out the activities that weren’t worth his time so as to focus on his best customers. Michalowicz is a serial entrepreneur who started his first business at the age of 24, moving his young family to the only safe place he could afford – a retirement building. With limited resources and no experience, he systematically bootstrapped a multi-million dollar technology business, sleeping in conference rooms to avoid hotel costs. After selling his first company, Mike launched a new business the very next day, and in less than three years, sold it to a Fortune 500 company. In the Pumpkin Plan, he describes his life story as well as the stories of similar entrepreneurs. This is not a book of theory. It’s chock-full of real-world examples from people who have had to sell products, make payroll and keep themselves sane. Chapters expand on the Pumpkin Plan concept, with checklists on how to discover what you do best and how to get back on track if you stray. What’s your Great Pumpkin? This Halloween, find out with The Pumpkin Plan. No one can resist free pizza. That was the idea behind a novel recruitment effort by Vocus, a public relations software company out of Beltsville, MD. They sponsored a food truck on the streets of DC and gave out pizza in return for a resume or card. Not only did I drop off a card, I got my name in a Washington Post article on the effort with a quote on how this tactic was good at reaching passive job seekers. New Article: How Do You Measure PR? PR is about getting the word out about your product, cause or service. I’d consider myself a semi-professional PR practitioner, busy trying to “induce” the public to do something increasingly unknown in 21st century America: read a book. And not just any book. My book, fiction, of all things, by an unknown author. But the room was filled with cash-poor independent filmmakers. How could they afford these PR services? And, moreover, would this be a good use of their limited funds? I asked if there was any way to connect the parties and screenings to the most important metric of all – ticket sales. But there’s no way to accurately measure the impact of PR. Which is what inspired me to write How Do You Measure PR? It’s on the blog FlackRabbit, published by my friend Margie Newman, who is perhaps the smartest PR person I know. We’ll see what answers her readers come up with. Author Joe FloodPosted on April 25, 2011 Categories rants, WritingTags DC, filmmaking, prLeave a comment on New Article: How Do You Measure PR? On the streets of DC, there is a proliferation of well-meaning people soliciting for good causes. It’s not just the holidays, they’re parked on sidewalks year-round. Clever, too, for they patrol in two-person teams and stake out opposite ends of the block. I have been known to walk in the street or pretend to talk on my iPhone to avoid them. Do You Have a Minute is a post I wrote for FlackRabbit, a blog on PR. My argument: these street teams cheapen the reputation of the charities they represent. How to pitch to local, national and social media. What I liked about the workshop was that Amanda and Jacqueline have a lot of practical experience in real-world PR. Their talk was spiced with useful examples and anecdotes from their work. They didn’t just tell you how to pitch a story to a reporter, they shared what should be in the email subject line and the best time to make a follow-up phone call. 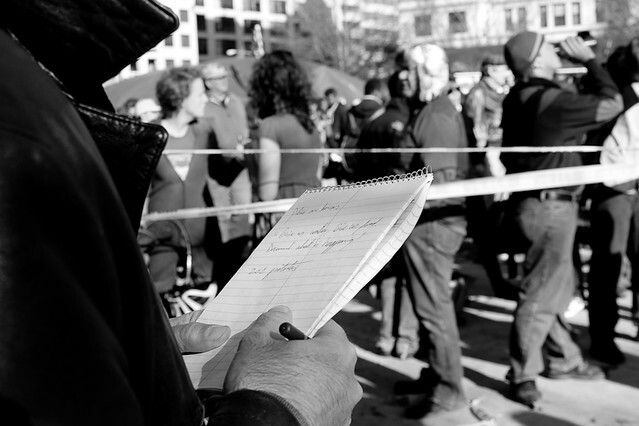 This is a good workshop for people who don’t want theory but want to know tactics – the practical steps they can take to get media coverage for their product or cause. Want to know what should be in a press kit? Should a backgrounder be in print or electronic format? Should you do a social media release? How do you deal with a TV producer? All of this was covered in the workshop. Workshop attendees consisted of small business owners, entrepreneurs and managers of small nonprofits – exactly the type of people who will do PR themselves, lacking the budget to hire a firm. The workshop was a really good fit for their needs and Amanda and Jacqueline tailored the class toward them. It was a very interactive session, with lots of Q&A and idea-sharing. As someone who’s promoting his own book (Murder in Ocean Hall), I left with a lot of useful ideas to pursue, including things I had never thought of before (people still listen to radio?). Elements of Publicity is just one of a series of low-cost workshops that Mopwater PR is teaching on blogging, social media and publicity. I wrote a little piece on making your blog look good on the iPhone for FlackRabbit, my friend Margie Newman’s blog. FlackRabbit is filled with useful thoughts on social media and PR. She’s a communications professional who really gets the web – there’s not many of them out there. Technically, I’m not in PR. But I’ve worked long enough in web strategy and communications to have strong feelings on the subject. Look for more articles on FlackRabbit in the coming months! Go Hollywood! What’s the Logline for Your Site? I can hear the protests already. Creating a web site is not like creating a movie, we don’t need to go “high concept” or any of that other Hollywood marketing fluff. We will build the web site, its value will be obvious, and it will sell itself to the appropriate audience. End of story. FADE OUT. Every year, around 300 movies get released into the crowded multiplexes of America. And they get encapsulated in a sentence or two to make it easier for moviegoers to find what they want. Every year, thousands of web sites get launched into the disorderly, low-barrier world of the web. How will your site stand a chance among all these competitors for your customers’ most valuable asset, their time? How will you differentiate your site among this cacophony? Just like a movie, you better be able to explain the purpose of your site in a sentence. For those who wish to look down on Tinseltown, you may refer to it as your “elevator speech.” If you can’t explain your site in 15 seconds to a customer, how are you going to get him to visit your site? Unfortunately, web development frequently begins with only the vaguest notions of what a site should be about. The CEO of Widgets, Inc., has ordered the construction of a new web site. It’s going to be filled with all sorts of fancy bells and whistles to impress his buddies at the country club. The MARKETING DIRECTOR is nervous. And I want Java. I read about that. I’ll get the techies to work on it. But, sir, who’s this site going to be for? Well, yes, you, obviously. But who is the audience? Customers? Investors? The press? What are we trying to do here? Before we start spending money, shouldn’t we figure that out? All of the above. And everything. Now get out. The new web site for Widgets, Inc., has been launched to crushing silence. It’s another bland, corporate web site. Can you explain to me why we have no traffic? I’ve thought about that, sir. And I think it’s because our web site has no identity. Our press releases, brochures, banner ads, and emails just talked about the “online home of Widgets, Inc.” They provided no compelling reason for anyone to visit. You better have a plan. The most popular feature on the site is designing your own widgets. It’s also the most profitable. Why didn’t you think of that in the first place? A good log line will help you focus your site around a single organizing principle. For example, eBay is “The World’s Online Marketplace.” Clickz.com provides news and viewpoints from the Internet marketing and advertising industry. The Onion is America’s Finest News Source. All these sites concentrate on one big idea which they do well. Here’s a tool to help you get started. url: where’s the site going to be located? title: what are you calling your site? logline: what’s the elevator speech for the site? Think this is simplistic? It is, and necessarily so. Oftentimes, like in the example above, web sites get built with many different consituencies in mind and with many different purposes. The result is design by committee and a web site that pleases no one, especially visitors. Creating a good log line is just the first step in marketing your web site. This first step is also the most important one. Taking the time to think about the unique benefits of your site will help focus the work of your web team on delivering a quality, unique site. It will also make later marketing efforts considerably easier and more effective. Author Joe FloodPosted on April 1, 2002 August 16, 2013 Categories WritingTags film, filmmaking, marketing, pr, seo, web, Web 2.0Leave a comment on Go Hollywood! What’s the Logline for Your Site?